InshaAllah we are always asking to be nothing and entering into the oceans of Rahmah, and that Allah ‘Azza wa Jal dress us and bless us. 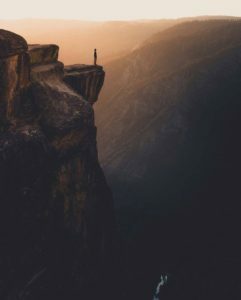 We take a path of efface, that reminding ourself to be nothing; to be nothing and that Allah ‘Azza wa Jal, the Creator, God, or whatever name we want to identify that reality of the Creator, is All Powerful, Almighty, is everything and I am nothing. As we take a path of learning to shut off, that Allah ‘Azza wa Jal can turn on and can send the lights and send energies upon the heart and upon the soul. Alhamdulillah, we took a path of haqqa’iq (spiritual realities) and under the teachings of awliyaullah (saints/friends of Allah), they teach us the greatness of Sayyiduna Muhammad sallallahu alayhi wa sallam; that to know the greatness of your Prophet alayhis salaatus salaam, to appreciate what Allah ‘Azza wa Jal has given to us. It brings a tranquillity onto the heart and brings lights into the heart, brings beatific dresses upon the heart, upon the soul, upon the tongue, upon the face so that everything begins to change. Because many people don’t understand the importance of Sayyiduna Muhammad sallallahu alayhi wa sallam, so they don’t understand the importance of Milad an-Nabi sallallahu alayhi wa sallam, the birthday of Prophet sallallahu alayhi wa sallam; that every moment is a reality for us but you have to take a path in which you begin to love Prophet sallallahu alayhi wa sallam and then begin to learn about the greatness of Sayyiduna Muhammad sallallahu alayhi wa sallam. Then we understand that this entire universe is under that light, and that this entire universe was waiting for the arrival of that light, from the heavens to come into this dunya. And once it entered in had e dunya, (physical world), it was a completion of God’s favour upon creation. 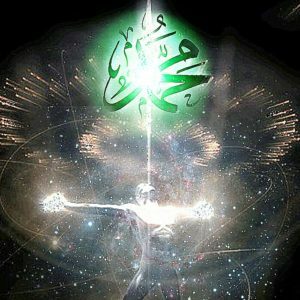 That they were existing within that light, but its full reality was not achieved until Prophet sallallahu alayhi wa sallam’s physicality entered into this world. And from this dunya, it dressed all entire universes, that rahmah (mercy). And we were talking the last few nights from ayat al-Qur’an of ‘feekum’, Surat al-Baqara, 2:151. We were describing that Allah ‘Azza wa Jal describes that Prophet sallallahu alayhi wa sallam is amongst you; and some ulema said he’s amongst you, alayhis salaatus salaam, and awliyaullah come into our lives and not only the light of Prophet sallallahu alayhi wa sallam is amongst you, but within you. That when light comes to be present, it doesn’t stay by itself. It diffuses into everything. 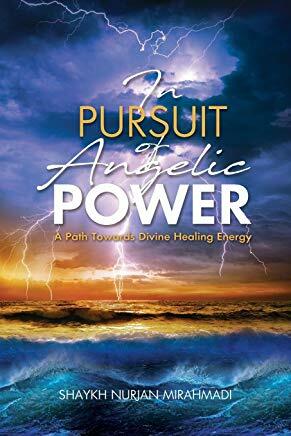 When we turn off the lights in the room and turn on one light and see how it moves into the room, light and the miracle of light, is it pushes through all darkness. Just one light is enough; one little candlelight is enough to illuminate infinite amount of darkness. That is the greatness of light, this is the greatness of the Mercy of Allah ‘Azza wa Jal, that as much as you put yourself into darkness, all it takes is but one light, one candle, one pilot light for Allah ‘Azza wa Jal to open; and immediately that light is already pushing away the darkness. You can add infinite more darkness and it doesn’t take anything from that light. It doesn’t extinguish that light. This is Allah’s greatness, that your hasanat and your good deeds can never be taken away; just keep adding your good deeds, keep adding your good deeds. This life become like a candle, become like three candles, like five candles and begin to illuminate the entire darkness and push away all difficulties. 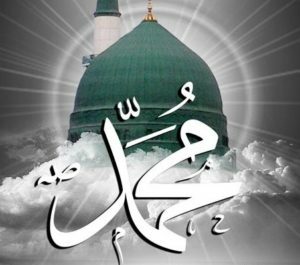 That with the Haqq of Allah ‘Azza wa Jal comes, means that with one Durood e Shareef, Prophet sallallahu alayhi wa sallam that’s what Prophet sallallahu alayhi wa sallam asks, ‘just mention me once’. Any time you think that you’ve left your deen, you’ve gone out of your faith, you’ve entered into bad character, shaykhs come and say, ‘Make your shahadah, come back into your Islam.’ So what kind of power Allah ‘Azza wa Jal gave to the mentioning of Prophet sallallahu alayhi wa sallam’s name? Then on your deathbed, you’re to recite Surat al-YaSeen, which is all the secrets of Sayyiduna Muhammad sallallahu alayhi wa sallam, to be dressed upon the one who is leaving this earth and returning back to their home. And Allah ‘Azza wa Jal’s Rahmah is that: recite Surat al-YaSeen with all its secrets being dressed upon that soul, all of its realities to go back into the presence of Sayyiduna Muhammad sallallahu alayhi wa sallam. Allah ‘Azza wa Jal is then describing, ‘zaki’, that that light, when it comes to be present with you, no doubt that the truth, it destroys falsehood. Because we can’t understand how great that is; but just for an example you go home and darken your room and turn one candle on and that immediately pushes away darkness. And Allah ‘Azza wa Jal describing, ‘That is zaki (Purification).’ The light of Prophet sallallahu alayhi wa sallam, it eats and devours every type of badness. ‘Zahuqa’, Allah (aj) describes, ‘he obliterates’; because what’s the haqq (truth)? How you’re going to bring the haqq of Allah ‘Azza wa Jal? Do you think Allah ‘Azza wa Jal is coming directly to you? This is not Azimat Allah, this is not the Greatness of Allah. Allah ‘Azza wa Jal created for us khalifa (representative), Allah (aj) said, ‘he is carrying all My Realities.’ As soon as you make Durood-e-Shareef, the light of Prophet sallallahu alayhi wa sallam comes and begin to purify and cleanse you. 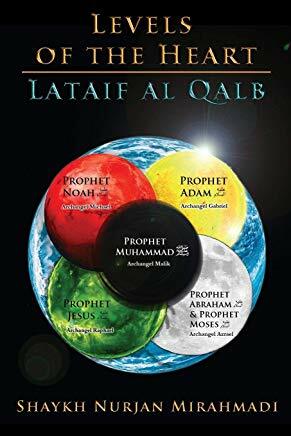 And they [saints] come and begin to teach us that for tariqas (Islamic spiritual paths) and ahl ul haqqay’iq (people of realities), the gift that Allah ‘Azza wa Jal gives to them is they take the individual beads of realities and knowledges, and with the barakah of Prophet sallallahu alayhi wa sallam, they sew it together. And what shaitan (satan) does to normal people is that he cuts that string and all they have are individual beads; means these are all the same ayahs of Qur’an, these are all the same hadith– why aren’t they putting it altogether? Because shaitan wants to break their string and just keep them to be independent beads. The turoqs, because they hold tight to the rope of Allah ‘Azza wa Jal, which is the love of Sayyiduna Muhammad sallallahu alayhi wa sallam, they put these beads all together for us. Awliya (saints) come and teach us: if you have a little bit of understanding, there was no kitab (book) in the time of Sayyiduna Muhammad sallallahu alayhi wa sallam. 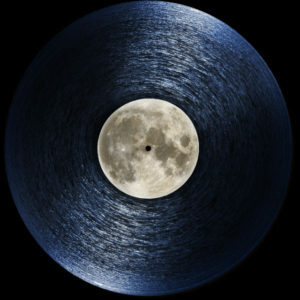 O’ Ajeeb (odd), When wahi (revelation) was coming, the kitab did not exist. Prophet sallallahu alayhi wa sallam didn’t bring a book. He was not Nabi Musa alayhis salaam that brought stone, on tablet, with writings. Means what was coming to Prophet sallallahu alayhi wa sallam was coming to the heart of Prophet sallallahu alayhi wa sallam; and Sayyiduna Muhammad sallallahu alayhi wa sallam was reciting the kitab. And the scribes, they were writing on parchment and they had no permission to put them together. So the ayah (verse) would come and be put aside; the ayah would come and be put aside. 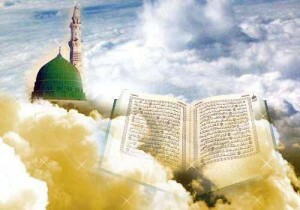 As Prophet sallallahu alayhi wa sallam is reciting his hifz, he is the walking Holy Qur’an; he IS the walking Holy Qur’an. He is the kitab! When Allah ‘Azza wa Jal says that, ‘The kitab, he is going to come and teach you the kitab and every hikmah (wisdom),’ so are you imagining that Prophet sallallahu alayhi wa sallam is actually bringing a book for you and says, come ‘Come sit down here,yeah, come sit here; this is alif, ba, ta’? Only now we are understanding: when light comes to you, light comes with all of its knowledges. The highest form of encryption and conveyance now of knowledge is through light- you have a phone, you have a smartphone. As soon as you have your smartphone, you want an app, you say, ‘Oh I want to have this version of the Holy Qur’an’. You click the app and it downloads everything onto your phone. You say, ‘I want all the hadith books available’; you click the app and immediately downloads onto your phone. 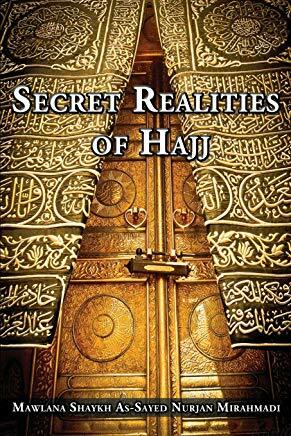 Through these technologies, Allah ‘Azza wa Jal is showing us Divine Realities. When Allah ‘Azza wa Jal saying that when the Nur ul-Muhammad sallallahu alayhi wa sallam comes, means Prophet sallallahu alayhi wa sallam was “Rahmat al lil-‘Aalameen” (Holy Quran 21:107); he was saying, ‘Just make one salawat on me, I’m going to bring back ten salawats upon you’. Then awliyaullah come and begin to teach us that when Allah ‘Azza wa Jal talking about kitab, there was no kitab. The kitab is Sayyiduna Muhammad sallallahu alayhi wa sallam. He was walking Qur’an. They asked ‘How was the character of Prophet sallallahu alayhi wa sallam?’ They said, ‘Have you read Qur’an?’ Means at that time they were hafiz, they had written the different ayahs (verses) of Qur’an and they were memorizing. They said, ‘Yes, Sayyiduna Muhammad sallallahu alayhi wa sallam was walking Qur’an. His character, his khulooq, was entirely walking Qur’an’. But awliyaullah come and teach: no, he was literally a walking Qur’an, because where was the Holy Qur’an coming from? 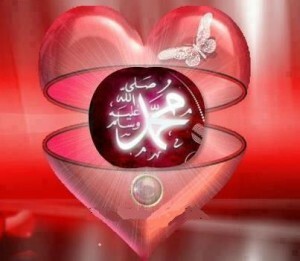 It was coming from the heart of Sayyiduna Muhammad sallallahu alayhi wa sallam. 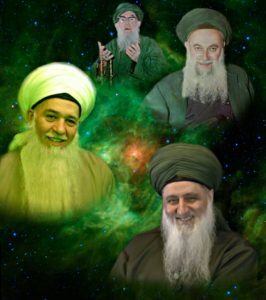 That, “by this reality of Sayyiduna YaSeen sallallahu alayhi wa sallam, he is the Qur’an; he is all the hikmah and wisdom.” beause Allah ‘Azza wa Jal said, ‘He is going to teach you ‘Aleemukum ul kitab wal hikmah’ (holy Quran 2:151)- what kitab, wal hikmah? “YaSeen, wal Qur’anul hakim”. Allah ‘Azza wa Jal testifies by the reality of Surat al-YaSeen, Sayyiduna YaSeen, because YaSeen is the name of Prophet sallallahu alayhi wa sallam, that he is the walking kitab. He is the walking kitab of Allah ‘Azza wa Jal, that Allah ‘Azza wa Jal described upon Holy Qur’an because we became jahal (ignorant). In the time of companions, there was no permission for Qur’an to be manifested – you know that in the history? In the time of Sayyiduna Muhammad sallallahu alayhi wa sallam, what the Arabs call [the book of holy Quran] is ‘mushaf’, there was no book. 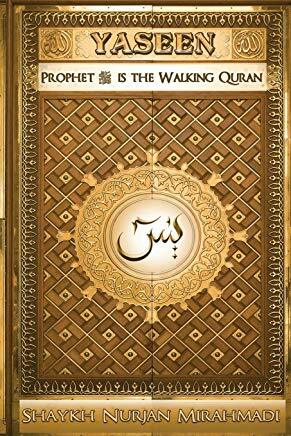 Prophet sallallahu alayhi wa sallam is walking Qur’an. How can you compile something in the presence of Sayyiduna Muhammad sallallahu alayhi wa sallam? It’s against adab (manners), he’s the walking Qur’an. You want to know Qur’an? You take it from Prophet sallallahu alayhi wa sallam, as Prophet sallallahu alayhi wa sallam is ‘wal hamd’, the Flag of Praise. So are you thinking with your mind that Holy Qur’an can be held in your hand? That you are able to put it (holy quran) on a paper? Where Allah ‘Azza wa Jal is saying that the Holy Qur’an, if it comes onto a mountain- think of Mount Everest- it would be dust. Allah ‘Azza wa jal says,‘If I reveal My Qur’an onto the mountain it would be dust, but if revealed to Prophet sallallahu alayhi wa sallam and he is firm’. What kind of azimat (greatness) is [Sayyidina Muhammad (saws) has]? Because we don’t understand that Allah ‘Azza wa Jal’s Qur’an is not created. Allah’s word is not from created, Allah ‘Azza wa Jal is beyond creation. The non-created word of Allah ‘Azza wa Jal is manifesting through His Creation, Sayyiduna Muhammad sallallahu alayhi wa sallam. Where did we see that before: ‘qaba qawsayni wa adna’, how the reality of Prophet sallallahu alayhi wa sallam was able to approach with all his physicality, Allah lifted and brought to His Divinely Presence. 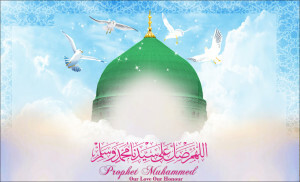 Prophet sallallahu alayhi wa sallam came and said the hadith, “I was the first of creation. So means that reality is not something that can be imagined. What Allah ‘Azza wa Jal wants for us and a reminder for us is that: we left the Qur’an, we left the Qur’an. This become furqaan. This becomes the furqaan, the book of right and wrong. 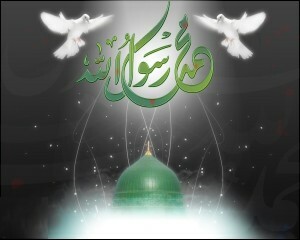 Its reality doesn’t open without the light of Sayyiduna Muhammad sallallahu alayhi wa sallam to be present with you. You have a book of right and wrong. If you read Quran without the love of Sayyiduna Muhammad sallallahu alayhi wa sallam, it becomes something very dangerous, because they don’t have a mercy and they don’t have a love, so what they read? They read all sorts of verses that we don’t understand where they are coming up with their understanding. Why are they harsh, why are they filled with hatred, why are all these things that are coming? Because they are reading furqaan and these are the people who have no muhabbat of Sayyiduna Muhammad sallallahu alayhi wa sallam. At every chance, they are trying to take down and bring down the greatness of Sayyiduna Muhammad sallallahu alayhi wa sallam; for what? Hizbul shaytaan (group of Satan), because shaytaan doesn’t like Sayyiduna Muhammad sallallahu alayhi wa sallam. He thought he was the khalifa and he was greatly disappointed. They take out in the translation to manipulate the Qur’an: the first ‘hu’ [‘AllamnaHu], is in reference to Prophet sallallahu alayhi wa sallam, that he is not taught poetry; the second ‘hu’ they don’t want to say that it is Sayyiduna Muhammad sallallahu alayhi wa sallam so they say ‘it’ but this is clearly a description of Prophet sallallahu alayhi wa sallam. Allah ‘Azza wa Jal describing: “innahu dhikrun wa Qur’anun mubeen,” that Prophet sallallahu alayhi wa sallam is the dhikrun and he is the Qur’anun mubeen. “Did We not expand for you, [O Muhammad], your Chest? (1)…. In Surat al-YaSeen, Allah ‘Azza wa Jal then is describing, “Inna hu dhirkun wa Qur’anul mubeen.” So means if they want, awliyaullah want now for us to unlock the power of Holy Qur’an. That this Qur’an, its power doesn’t open without the light of Sayyiduna Muhammad sallallahu alayhi wa sallam in your life. Means that maqam al-iman (station of faith), what Prophet sallallahu alayhi wa sallam asked, “Love me more than you love yourself.” If you love Prophet sallallahu alayhi wa sallam more than you love yourself, means that Nur ul Muhammad is all around you, sallallahu alayhi wa sallam. You are constantly making durood, you are constantly in praising, in tafakkur (contemplation), so that the light of Prophet sallallahu alayhi wa sallam is around. Then Allah ‘Azza wa Jal says, ‘Now you are dressed with the dhikr and the Qur’an al-Majeed,’ that this Qur’an is going to dress you and bless you, and every power, every letter is going to be coming into your heart, from who?- the one who has the kitab and the hikmah. He is the teacher for Allah ‘Azza wa Jal. So when they read Qur’an, they are reading furqaan; they left out the nur of Sayyiduna Muhammad sallallahu alayhi wa sallam in their lives. Without the love of Prophet sallallahu alayhi wa sallam, Allah ‘Azza wa Jal made it very easy; this has to be encoded, otherwise anybody could pick it up and take the secrets of the heavens. And at that time of Prophet sallallahu alayhi wa sallam it wasn’t around. And he brought through his heart and brought through his light, and that light is eternal, that that light is alive. That light is continuously flowing the realities of Holy Qur’an. Prophet sallallahu alayhi wa sallam said, “I’m a RasolAllah eternally,” means that, “that Qur’an is continuously flowing through my heart.” Don’t come to only a part of it and leave out the other part. So it means then for awliyaullah and for those who follow the love of Sayyiduna Muhammad sallallahu alayhi wa sallam, they’re reminding for us that: to bring back that power, that the power of Holy Qur’an is with the love of Sayyiduna Muhammad sallallahu alayhi wa sallam. 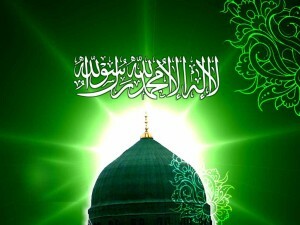 If that Nur ul-Muhammadi sallallahu alayhi wa sallam is with you, is continuously conveying to your heart. That is what all these devices are teaching us. Every device now is conveying: you want something, I can immediately send it to you. There on Apple [devices], I can drop, airdrop to you; you want a file, I can just drop it to you, it goes straight to your phone. These are all toys. What about the greatness of Prophet sallallahu alayhi wa sallam? 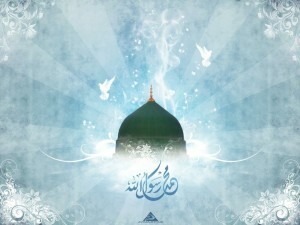 What is the 10 Salawat Prophet (saws) is making on you? We pray that Allah ‘Azza wa Jal open for us on these nights of Mawlid an-Nabi sallallahu alayhi wa sallam; means if we understand that Prophet sallallahu alayhi wa sallam is the KitabAllah, there was no Qur’an manifested, he was walking Holy Qur’an. If you are thinking that you love Allah ‘Azza wa Jal, you love Allah ‘Azza wa Jal’s kitab, you don’t think you should come to celebrate Milad an-Nabi sallallahu alayhi wa sallam (prophet Muhammad (saws)’s birth), that you should be praising Allah ‘Azza wa Jal, ‘Ya Rabbi, you sent Rahmat al-lil ‘Aalameen (Mercy to Creation); and the rahmah that You sent is the KitabAllah that came through the heart and the soul of Your Most Beloved.’ If not for the existence of Prophet sallallahu alayhi wa sallam, no KitabAllah for us, no Holy Qur’an came onto this earth. In this Mawlid an-Nabi sallallahu alayhi wa sallam come and thank Allah ‘Azza wa Jal for the Holy Qur’an. And then we begin to understand that greatness, towards the understanding of the greatness of Sayyiduna Muhammad sallallahu alayhi wa sallam, InshaAllah. Please Donate and support to spread these heavenly knowledge.